Now that it’s “officially” Fall, I’m so excited to dive into the sultry side of my makeup routine. I love the deep warm browns, burgundies, and plums that are on trend every year. I’ve kept my ear to the ground monitoring some of the new drugstore makeup for fall that’s now available, and I have to admit that I’m a little overwhelmed! So much great stuff headed our way this season, but I’ve narrowed down some of the newness to what looks most interesting to me, and what can come together to create a full makeup look. 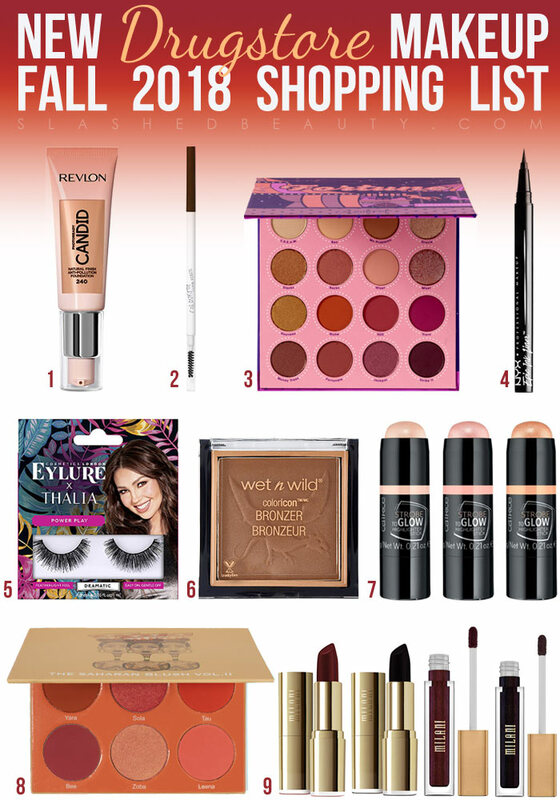 So this month’s new drugstore makeup roundup is a little bit different than my previous ones… this time, I’m calling out the must-have makeup releases for fall that can all be used together for endless seasonal looks. Click the picture of any item to find it online. The newest foundation at the drugstore, the Candid Natural Finish is a great pick for fall. Its formula is similar to a moisturizer, with a creamy texture that blends to even out skin tone while feeling lightweight. It will keep your skin feeling moisturized all day, which is super helpful as we head into the windy, chilly weather. This is a medium coverage foundation with a natural finish, and is oil-free! ColourPop just launched their new eyebrow pencil, which is a skinny twist-up crayon style with a spoolie on the opposite end for blending. This is personally my favorite type of brow pencil, so I’m dying to get my hands on this one! It creates thin strokes that mimic the natural hairs with buildable color. But of course, I can’t talk about ColourPop without mentioning their new Fortune palette! This is my dream fall eyeshadow palette. Beautiful warm neutrals with pops of gold and berry tones and some gorgeous glowy bronzes. This will be a fall eye go-to for sure. I don’t know about you, but as it starts getting windy and drier in the fall, my eyes love to water. That means it’s time to work in some waterproof liner, and NYX has us covered with their new Epic Ink Liner! Some have said this is a good dupe of the Kat Von D Tattoo Liner, as it’s a pen style with a brush applicator. Perfect for easy cat eyes. Our holiday social schedule tends to start picking up this season, so bring the drama for special occasions with some luscious lashes. The new Eylure x Thalia faux mink lashes collab has a style for any occasion, but I love the Lady T style the most with the full appearance and flare at the corners. The classic just got a makeover! The new Color Icon Bronzer is a hybrid formula of cream and powder for a smooth application and weightless feel. It comes in both a cool tone shade for contouring (Queens Land) or warm tone for adding a sun kissed glow (You’re Dragon Me Down). I love using cream products to help make my skin look luminous, so these new highlighting sticks seem like they’ll fit the bill perfectly. Available in three shades, the Strobe to Glow Highlighter Sticks are chubby twist-up highlighters that are easy to swipe on and blend out, even if you’re just using your fingers. I recently reviewed this palette, so you can see swatches here. Juvia’s Place is new to Ulta Beauty and this blush palette has something for every look. The plum and cider shades are perfect for fall, but you’ll get use of this year round as it also features lighter pinks and even an orange! Milani just released limited edition shades in their classic Statement Lipstick and Lip Creme formulas that are bringing vampy to a whole new level. The Statement Lipstick shades include Red After dark, a deep sultry red, and Black Spell… you guessed it, a rich black. The lip cream shades are similar— Vixen is an oxblood and Wicked is a bold black. What’s on your fall makeup shopping list this season?